Phenology doesn’t take a vacation, but I do. But before this Phenologist-in-Residence migrates north for two weeks of relaxation, I wanted to share this video chronology. I believe these are American Toads and for now they live in the pond near Spoonbridge and Cherry. Will they hop away before my return in July? And what other day-by-day changes will transform the Sculpture Garden & Open Field? 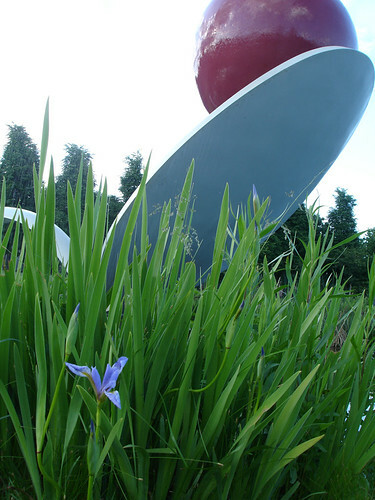 In conjunction with Open Field, I’ll be posting a series of reports that examine Open Field and the Minneapolis Sculpture Garden through the lens of phenology. The lens of what now? Phenology refers to recurring life cycle stages, such as leafing and flowering, emergence of insects, and migration of birds. As an amateur naturalist and the Open Field Phenologist-in-Residence, it’s my privilege to observe, document, and share the sequence of natural events as it unfolds on the Walker campus. Read the Twitter chronicle so far @OpenPhenology: twitter.com/openphenology.